In another act of utter recklessness, US President Donald Trump yesterday again threatened North Korea with destruction if it failed to totally capitulate to Washington’s demands. By declaring that military action is not only an option but could be imminent, he is relentlessly pushing the Korean Peninsula, Asia and the world toward the precipice of a calamitous war. Amid his repeated bellicose military threats, Trump has never spelled out what he would regard as the “preferred option.” He has repeatedly dismissed holding talks with North Korea. His tirades against the 2015 denuclearisation agreement with Iran effectively have ruled out a similar deal with Pyongyang. 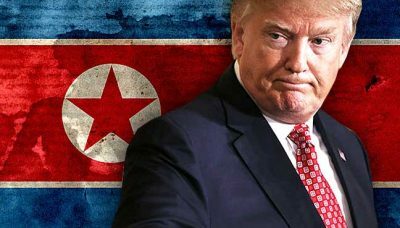 One can only conclude that Trump expects North Korea to abandon its nuclear arsenal and submit to an ever-expanding and intrusive system of inspection as the precursor to an endless stream of further demands to toe Washington’s line at home and internationally. In other words, Pyongyang must voluntarily submit to becoming an American vassal. Moreover, even if North Korea did agree to such a future there is no guarantee that would prevent a war with the world’s most powerful military. The Pyongyang regime is only too well aware of the fate of the Iraqi and Libyan leaders after they agreed to abandon their so-called weapons of mass destruction, actual or fictitious, only to confront a US-led military onslaught. The only conclusion that can be drawn in Pyongyang is that the country confronts an imminent attack from the US and must act accordingly. Ri spelled that out on Monday. He warned that Trump’s threats meant Washington had declared war and North Korea would be compelled to take military countermeasures. The Trump administration is also rapidly tightening the economic noose around North Korea, mounting what is in effect a full embargo aimed at collapsing the country’s economy and provoking an acute political crisis in Pyongyang. The US Treasury yesterday announced sweeping new bans on eight North Korean banks and 26 individuals, aimed at choking off Pyongyang’s access to the international financial system. Washington no longer makes the slightest pretence that sanctions are targeting North Korea’s nuclear and missile programs, and not the country and its population as a whole. Last week Trump issued a sweeping executive order authorising the US Treasury to cut off any country or company doing business with North Korea from the American financial system. The order is aimed in particular against China, which is by far North Korea’s largest trading partner, and also Russia, which hires tens of thousands of North Koreans as guest workers. However, by applying these bans, Washington is also targeting the countries in which these entities operate—namely China, Russia, Libya and the United Arab Emirates. All these nations now confront the threat of US penalties against their economies. These unilateral American sanctions, which have been imposed already on several Chinese companies, underscore the fact that, in threatening North Korea, the US is preparing for a far larger confrontation with China, which it regards as the chief obstacle to its world supremacy. That was underscored by US Joint Chiefs of Staff chairman General Joseph Dunford who told Congress yesterday that China “probably poses the greatest threat to our nation by about 2025.” He cited China’s economic growth and military expansion, which is still dwarfed by the American economy and defence spending. Confronted with the danger of war on their doorsteps, Russia and China are preparing accordingly. Last week the Russian and Chinese navies initiated an eight-day joint training exercise in the Pacific in areas close to North Korea. This week the Russian armed forces began a major air force exercise in the Russian Far East, close to its border with North Korea. Through its constant threats and military provocations, the Trump administration has deliberately created an explosive situation in North East Asia. By boxing North Korea into a corner diplomatically, economically and militarily, the unstable regime in Pyongyang is being goaded into taking desperate measures that Washington will exploit to launch a criminal war of annihilation that could rapidly drag in other nuclear-armed powers such as China and Russia.